This painting made it’s public debut at UU WomenSpirit on The Mountain this Fall. It was a bit of a last minute rush to get back in contact with my printer guy after he was in Paris for a month but here you go. This was inspired by a guided visualization by Sophia Ojha. The plan for the visualization was to visit our Sacred Garden, a place where everything in it represents something in the real world, a place that you can plant dreams, pull up and discard things you don’t want in your life, etc. I was excited for this meditation but the idea worried me. I don’t know plants well enough, how would I create such a beautiful place? Also, what is with all this visualization? Where did I assume it was coming from? How “woo woo” was this getting? Was I looking someplace else for connection other than to God? Well, I love visualizing and dreaming so I set out with Sophia’s guidance and went on a long journey to get to the garden. At one point we were sailing through the milky way, and we were to arrive above the milky way and into our garden. What I imagined was my sacred garden set in the milky way in a dark forest and there, in the dark forest was the lit labyrinth I had walked on The Mountain at previous UU WomenSpirit retreats. I was so excited! I didn’t have to visualize any plants, it was too dark. The memory of walking the labyrinth at night was so clear in my mind it was like I was back at it, the cold, the damp hard path, the flickering lights in the jars – but in my sacred garden the jars were full of fireflies flitting about. 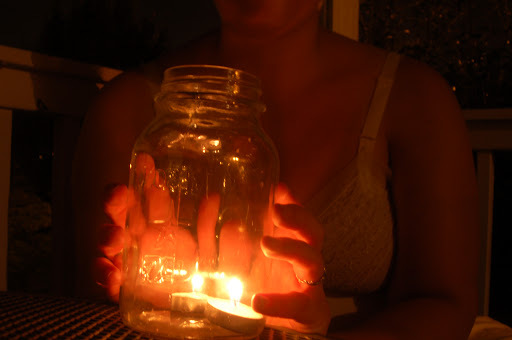 There was no top to the jars, the fireflies were just there of their own accord. In the center of the labyrinth was a bright light and I knew it was God. I was so excited to be in His presence but I dutifully walked the labyrinth, savoring the moment and meditating on how wonderful it was to be so close to my Father. When I finally reached the middle it was pure light in the cold night. I had the chance to talk one-on-one with God Himself! The first thing I asked was what he thought of my garden. “Is this ok? Do you approve of this? It seems so real and I really like it here.” He said, “Rachael, this is you, you have a vivid imagination. I love you and I am here to meet you here, where you are, in the way that works best for you. Look how real I am to you in this moment.” I was so happy and content. I just stayed there happy and thankful, not needing to express any of my feelings. The visualization ended too soon. Sophia has a great approach where she calls people to start preparing to leave. I was almost devastated. I didn’t want to leave, I had just gotten to be in God’s presence. I could stay there all night and enjoy the lights of the labyrinth. “Please, why do I have to go!” I said to God, I want to stay here with you, but the immediate knowing was that God is always with me. That wasn’t a good enough reply. What can I do to keep this moment? “Here”, said God, “Take this”, and from behind His bright being He brought out a jar of 3 fireflies and handed it to me. I took the gift with gratitude but I didn’t really understand it. I walked the labyrinth out, I exited under the awning and I walked the wooden walkway out into darkness, out to the real world, holding the jar. It was a long slow walk and I got to contemplate about the stars, they were inspired from amazing night sky photos Jason had shown me on the internet just a few weeks before. Every star was visible and shining. I felt so beautiful to be a part of all this and as I walked I thought about the image that would illustrate this vision for me. The exciting part is that this was all in me, my imagination. The fireflies were as bright as the stars, God was like a star at the center of the labyrinth. I could see it all connected. 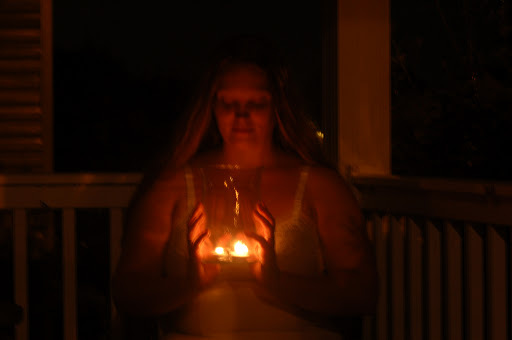 It took several days of pondering but what I got from the meditation was that the jar, containing the fireflies, represented me and how all the stars, God, and the fireflies were part of me, my meditation. I had the power to carry that with me always and to bring it out into the world. As I walked in my Sacred Garden, I came to its center where I dwelt with God[dess]. 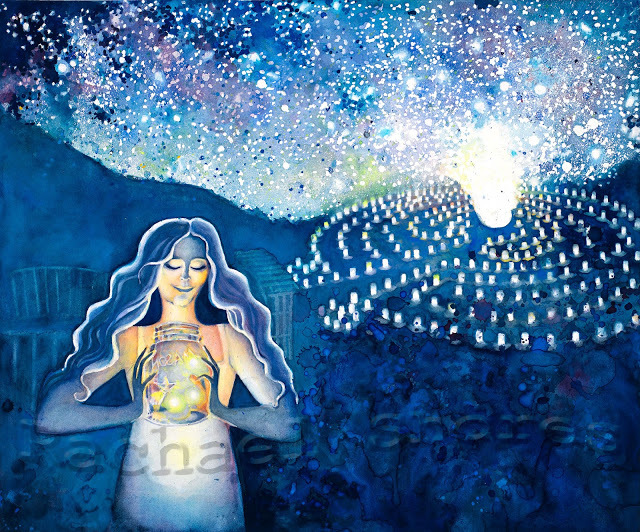 jar, God[dess]’s light, and all the light of my Sacred Garden is always in me.